Scooper - Technology News: Which countries are the biggest early-adopters of the Internet of Things? 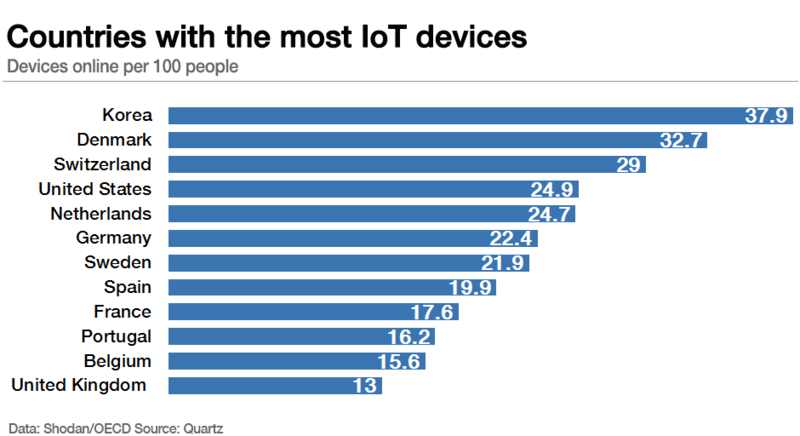 Which countries are the biggest early-adopters of the Internet of Things? The internet is infiltrating all of our devices, from thermostats to stoves. Yet, the technology seems to be more popular in other countries than in the US. The Koreans, Danish, and Swiss have more things tethered to the internet, according to data from the Organization for Economic Cooperation and Development (OECD) and search engine Shodan. The Internet of Things (IoT) as an industry is still nascent, but that hasn’t stopped many tech companies from developing IoT devices, software and systems. In January 2014, Google acquired Nest , a smart thermostat and fire detector manufacturer, for $3.2 billion. Amazon released a voice-controlled speaker, the Amazon Echo, in November 2014, and the device has steadily grown in popularity . Apple released a revamped Apple TV over the summer to digitize the living room, with Siri integration and a sleek remote. Still, IoT technology hasn’t gone mainstream. Changing behavior is difficult, and many technical issues like security need to be solved. But the OECD says that IoT devices can help governments make their operations more efficient, and transform transportation monitoring, eHealth, and energy.